On Sunday, April 20th, Soh Daiko was honored by the Japanese American Association of New York when a cherry tree was planted in Flushing Meadows Corona Park in recognition of our 40th anniversary. Joined by founding and former members Alan and Merle Okada, Jenny Wada, and Sandy Ikeda, our full 40-year lineage was present to take part in the event. Given the opportunity, we chose to have a Somei-Yoshino cherry tree planted. This variety is one of the most populous and recognizable trees in Japan, and also the same variety found encircling the Tidal Basin in Washington, D.C. – gifts that represent the lasting bond between Japan and the United States. In a similar way, our tree represents the bonds shared by Soh Daiko’s members; we recognize one another, and we are stronger together. Thank you, JAANY, for this beautiful honor. We look forward to many more years of continued friendship and support! On Arbor Day in 1992, Yamazakura and Somei-Yoshino cherry tree seeds were presented by Shigeru Inagaki, then President of the Japanese American Association, to New York City. Almost 10 years later, the 168 cherry trees nursed from those seeds were re-introduced to the City of New York and planted in Flushing Meadows Corona Park. On April 12, 2003, the first Sakura Matsuri was held among these trees, and this annual tradition has carried on ever since. 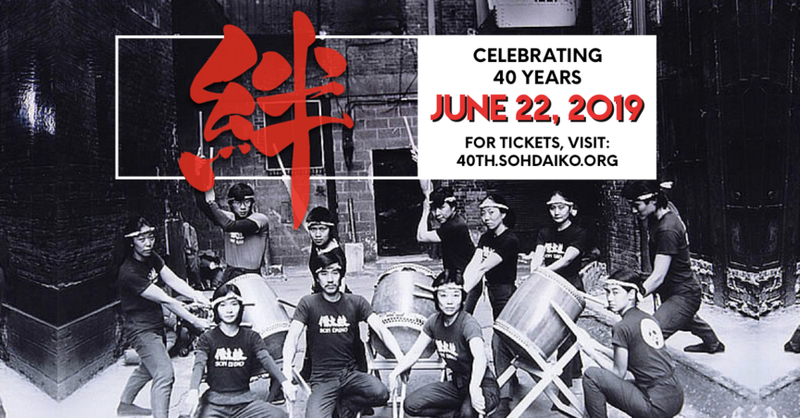 Celebrating 40 Years – In Concert! Enter promo code HAYAOKI to receive a special early-bird discount. Posted in News | Comments Off on Celebrating 40 Years – In Concert! Introducing the 2018-2019 Trainee Class! Posted in News | Comments Off on Introducing the 2018-2019 Trainee Class!